My "baby" has now reached double digits, but it's not been so long that I don't still remember how brutal morning sickness can be, and now my youngest gets miserably carsick. So I was happy to hear relief may be on the horizon. 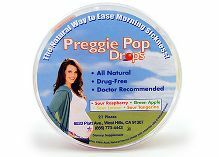 Three Lollies makes all natural products for nausea associated with morning sickness, travel sickness, cancer treatment all other types of nausea and offered to send us some samples for spreading the word. We haven't tried them yet, but it's road trip season and we'll have more than plenty of opportunities to put these drops to the test. Back during my 2 pregnancies, my so called morning sickness wasn't just morning, it was 24/7 sickness like an evil joke flu bug that lasted 4 miserable months. The first time, I had a 50 hour a week, driving intensive job training employees of Best Buy, Staples, and other tech retailers on Kodak camera, some of the first smart phones, and Siemans routers. I had to travel a 3 state region by car and just resigned myself to carrying a toothbrush, paste and a passenger seat full of plastic bags. I tried slices of fresh ginger,umeboshi salt plums, pressure point motion sickness wrist bands, ginger ale, ginger candy... you get the picture. Nothing helped. I'm happy to say I'm all done doing that. No more "tummy babies". However, now my poor youngest gets carsick any time we travel more than an hour or so. We've tried the same regime, since I'm committed to trying natural, drug free approaches whenever possible. But she would literally rather puke than eat ginger and the bands were useless. Click here to save 20% Off Any Order at Three Lollies, Natural Nausea Products through US Family Coupons. Ends 5/30/2014.